In Winter 2006 I bought this 2nd TL1000S and modified it for racing. 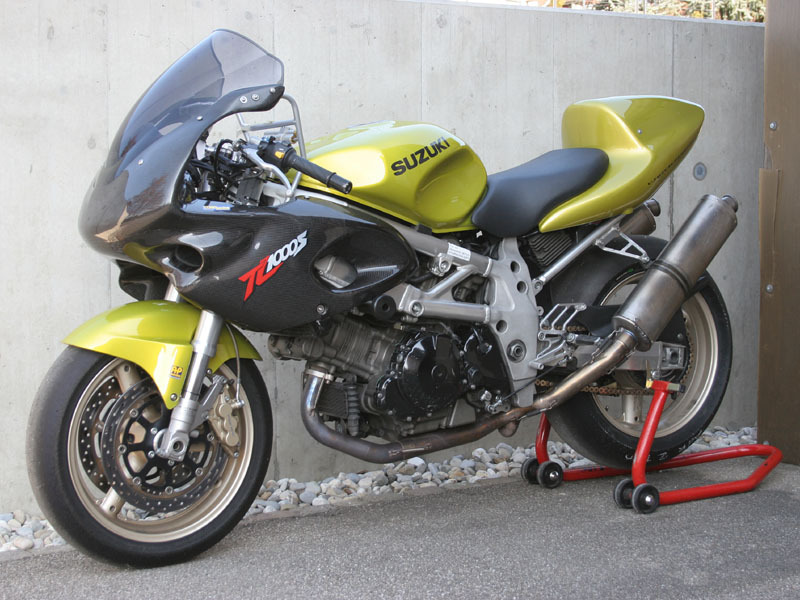 It has been used as track bike for three seasons until 2009, every season finished with the victory in the TL1000 Cup. By the end of 2009 this bike has been sold. Photo: March 2009, with new/repainted fairings. Suzuki TL1000S 1998 engine. All internals except the clutch are stock. Slipper clutch by Suter. Rear: Wilbers 641 shock (custom, 5mm longer), Spring by Lindenmann Engineering, custom spring guide by Stäger. Adjustable linkage. Wheels Stock Suzuki TL1000 / GSX-R SRAD cast aluminium rims. 3x front rim, 3x 6" rear rim, 1x 5.5" rear rim. Brakes Front: Tokico 6 piston calipers (lightweight coated pistons) with GSX-R 750 K4 radial master cylinder and steel braided lines. Stock rotors. AP racing carbon brake pads. Rear: GSX-R 1000 K1 rear caliper, steel braided line. GSX-R K1-K8 and custom machined TL rotors. Racebike weights about 20kg less than streetbike. 2009: Winner of German TL1000cup (3 wins, 2 second places), 2nd place in SPS-Race Dunlop Cup, 8th position in Swiss Open Brno. My parents, Brechühl Motos (mechanic, parts), Stäger Motos (suspension), Bikeroffice (tyres+service, parts), Kaderli Motos (tyre service).